With traders waiting with bated breath for hours, moments ago the White House announced that it has imposed tariffs on approximately $200 billion worth of imports from China, effective September 24. 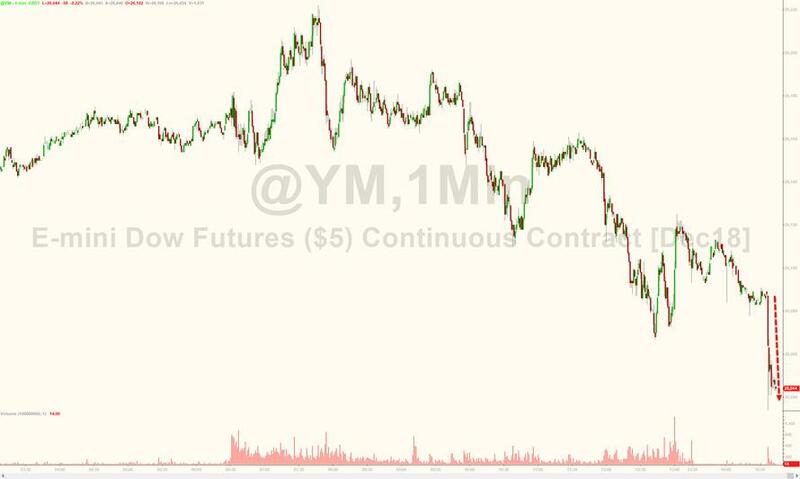 The tariffs will start at 10% until the end of the year, but in an unexpected twist, are set to rise to 25% on January 1, 2019, in what is worse case scenario than what the market had been pricing in, namely a 10% rate indefinitely. 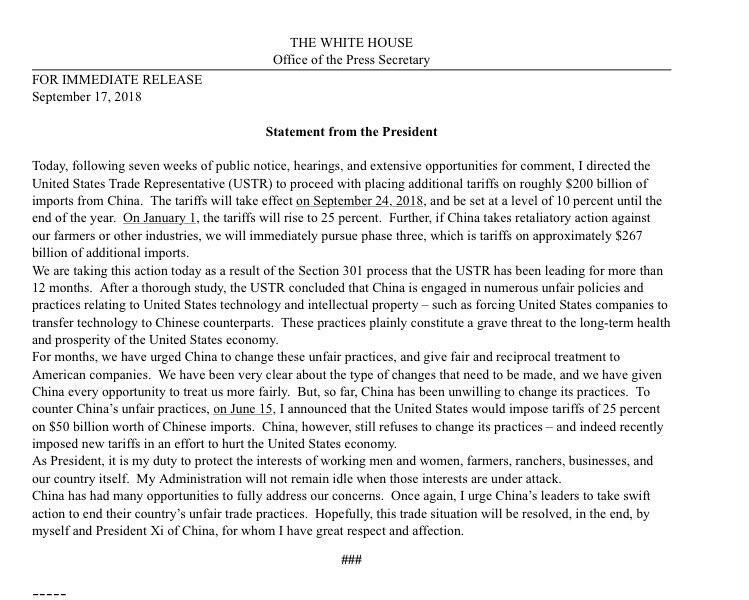 Trump also warns that if China takes any retaliatory action "against US farmers or other industries", the US will immediately pursue "phase three", and impose an additional $267 billion in tariffs on Chinese imports. The statement notes that while the US has given China "every opportunity to treat us more fairly", so far China "has been unwilling to change its practices." Trump concludes by saying that it is his duty "to protect the interests of working men and women, farmers, ranchers, businesses, and our country itself. My Administration will not remain idle when those interests are under attack. China has had many opportunities to fully address our concerns. Once again, I urge China's leaders to take swift action to end their country's unfair trade practices." Separately, the USTR announced that it has removed about 300 product categories from the tariff list and has cut some subsets of products, but the total value remains "approximately $200 billion", and - as we showed earlier - a substantial portion of the imports targeted this time are consumer goods, which means that the pain to the US household bottom line is about to get real. Today, following seven weeks of public notice, hearings, and extensive opportunities for comment, I directed the United States Trade Representative (USTR) to proceed with placing additional tariffs on roughly $200 billion of imports from China. The tariffs will take effect on September 24, 2018 and be set at a level of 10 percent until the end of the year. On January 1 the tariffs will rise to 25 percent. Further, if China takes retaliatory action against our fanners or other industries, we will immediately pursue phase three, which is tariffs on approximately $267 billion of additional imports. We are taking this action today as a result of the Section 301 process that the USTR has been leading for more than 12 months. After a thorough study, the USTR concluded that China is engaged in numerous unfair policies and practices relating to United States technology and intellectual property — such as forcing United States companies to transfer technology to Chinese counterparts. These practices plainly constitute a grave threat to the long-term health and prosperity of the United States economy. For months, we have urged China to change these unfair practices, and give fair and reciprocal treatment to American companies. We have been very clear about the type of changes that need to be made, and we have given China every opportunity to treat us more fairly. But, so far, China has been unwilling to change its practices. To counter China's unfair practices, on June 15, I announced that the United States would impose tariffs of 25 percent on $50 billion worth of Chinese imports. 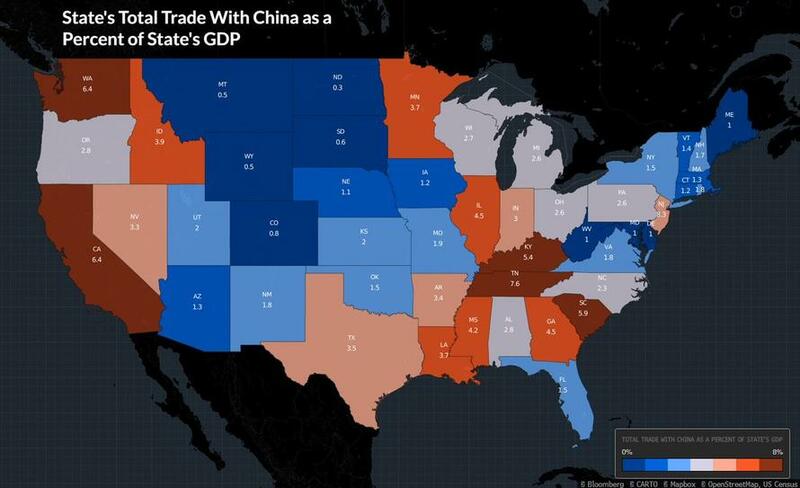 China, however, still refuses to change its practices — and indeed recently imposed new tariffs in an effort to hurt the United States economy. As President, it is my duty to protect the interests of working men and women, farmers, ranchers, businesses, and our country itself. My Administration will not remain idle when those interests are under attack. China has had many opportunities to fully address our concerns. Once again, I urge China's leaders to take swift action to end their country's unfair trade practices. Hopefully, this trade situation will be resolved, in the end, by myself and President Xi of China, for whom I have great respect and affection. 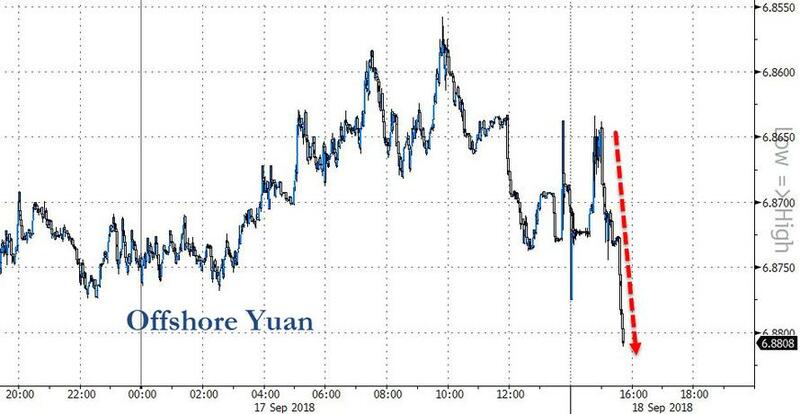 ... as did the Chinese yuan. And now we wait China's response which may well be greater than the $60BN in tariffs on US goods that it warned previously it would retaliate with automatically.